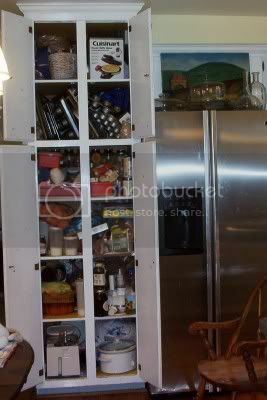 The before shot of an overly stuffed pantry! Debbie, I had to run out to the shed and look at the paint bucket to be sure! It's Clean Yellow by Porter Paint, which is a regional brand sold to professionals here. I used it in every room of the house this time, except for the study, where I used one shade stronger, Cape Daisy. I had a lot of trouble finding a yellow which was neither green-toned nor dulled down with ochre. Thanks! This is what I like about your blog. Generous dose of truly helpful info.